Connie graduated from Brown University with a BA in American Civilization. 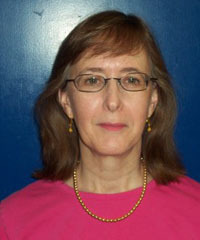 She moved from New England to Rochester in 1978 and joined the Department in 1981 as a temporary receptionist in the Department office and then staying on in that position for a few years. Since 1992 she has been supporting the particle physics group, the Teaching Internship program, the Pre-College Experience in Physics to Encourage High School Women in the Sciences, the PARTICLE program, and the Research Experience for Undergraduates Program. She shared the Goergen Award in 1998 for Distinguished Contributions to Undergraduate Learning (with Priscilla Auchincloss, Lynne Orr and Arie Bodek).